In the market for a healthy planet! FORESTOPIA works with small-holder farmers around the globe to promote agroforestry systems and sustainable livelihoods. We cultivate long-term relationships with communities and grower's cooperatives, working together to implement agroforestry and conservation practices. Agroforestry methods that integrate perennial trees with other crops can help increase and diversify farmer incomes while providing numerous environmental benefits, such as improved soil and water quality, bio-diversity protection and increased carbon sequestration. Forestopia also works with our partners to develop markets for their agroforestry and non-timber forest products including cacao, coffee, spices, tea, nuts, oils and resins and natural dyes. All profits from the sale of Forestopia products are re-invested to support capacity building in the grower communities we engage with. 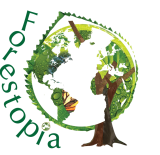 Coming soon in 2019, Forestopia will launch it's online marketplace, featuring a wide range of quality products sustainably produced in tree-based agroforestry systems by Forestopia's partner growers. Forestopia, in the market for a healthy planet! PLEASE PARDON OUR APPEARANCE WHILE WE DEVELOP OUR NEW WEBSITE. THIS SITE IS UNDER CONSTRUCTION.